A few years back I started riding dirtbikes. Up to that point in my life, I had it all figured out. At work, I had built and maintained marketing databases better than any of my uninformed superiors could have done and I knew it. I had been the top salesperson in a couple of different positions and, at that point, had a well-rounded background in different facets of the motorcycle industry. I knew the industry. I had my ear to the ground and I was a passionate motorcyclist, heck, some of my bosses didn’t even ride and others seemed to have no clue about the motorcycles at all! Thankfully for them, I did. There were instances where I had a really hard time working on projects that I knew weren’t as efficient or focused as they could be. Most of the time, I would reluctantly put my head down and get the job done. Other times, I’d voice my opinion and get myself in trouble. I was, in a word, obdurate. When I started riding dirtbikes, I approached things the same way. I know how to ride motorcycles, I’d been riding fire-breathing 1000cc street bikes for years. I was excited to begin ripping this little 250 around. As soon as I got into the sand on my new (to me) KX250F, I realized I had no f*cking idea what I was doing. I was all over the place flailing from side to side down the first sand wash. I’d knife the front, get up and do it again a few feet later. What the hell was happening? What do I know about dirtbike riding now? It can be tiring. 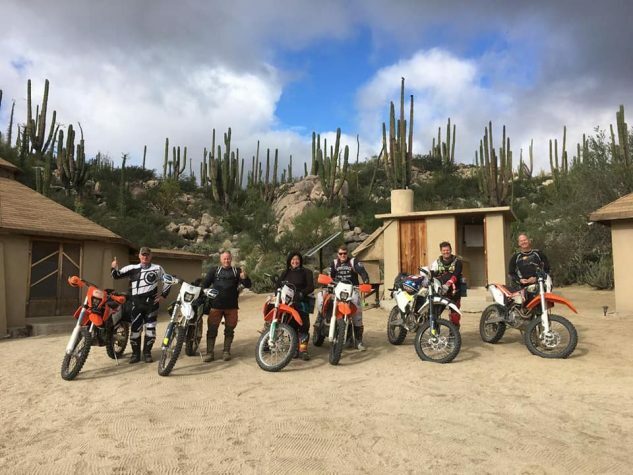 Thankfully, for this first foray into off-road riding, a friend and mentor had set up this excursion with herself and two others who had been riding for nearly a hundred years between them, to help teach me the ways of the dirtbike. Which was good, because I had never felt more hopelessly lost in trying something new. Especially something that I was sure I knew how to do. They spent the next few hours and numerous occasions over the following days teaching me the fundamentals of riding off-road. I put everything I thought I knew in the back of my mind, listened carefully, applied the techniques I was taught, and continued to work on them. I had no choice. My riding improved exponentially over the three days and, as they say, the rest is history. I love riding off-road. 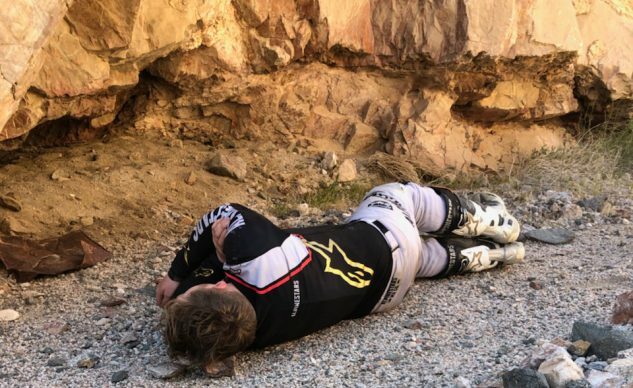 I love exploring in ways only a dirtbike can offer and it’s now what I spend my personal time doing away from MO and why you’ve seen more dirt-focused content here than in the past. Part of the reason riding offroad became such an instant passion for me, was because I pushed everything I thought I knew into the back of my mind and listened to those who were more experienced than me. It just so happened that I had good teachers and what they taught me instantly worked when I applied, so it was much easier to understand how well listening works sometimes. Huh. Weird. Every time I ride off-road I work on my skills and that has taken me to some pretty amazing places. I look back and in just the past three years the outlook that helped me hone my dirt riding skills has completely changed the way I learn. This job is yet another example of getting thrown into the deep end for me. I wasn’t a writer prior to becoming an associate editor at MO (surprise, er maybe not). I felt that I had something to offer the website and could provide a different perspective for readers, so I applied, and Sean Alexander hired me. From day one – well not exactly day one because Duke was salty that he didn’t get a say in the hiring process – I had a crew around me of great writers who have been in the industry for a collective… long time. Kevin warmed up to me and eventually would become one of my best mentors. I’ve learned plenty from Evans, Troy and John and even other journalists in this industry. I’ve learned a lot since that day in the desert crashing my brains out left and right. Mostly, I learned just how much I didn’t know. I’m not perfect, and I’m still plenty bullheaded, but I’ve learned to listen and be open-minded and in doing so, I’ve become a better student. There’s always something to be learned, particularly so when you think you know it all. 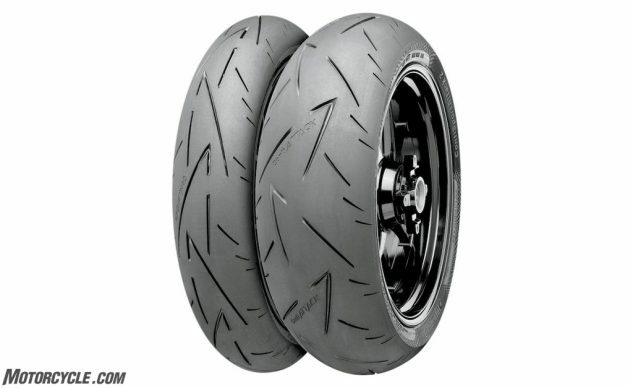 The post Countersteer: What You Know appeared first on Motorcycle.com. 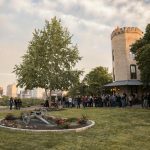 Although the cruiser craze of the late 1990s and early 2000s has long since passed, there are still tons of riders who love cruisers. 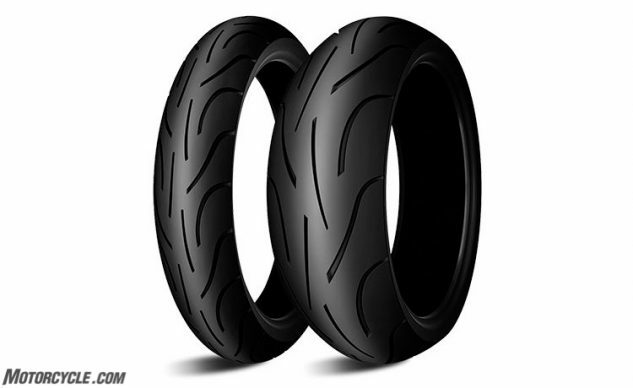 For newer riders or those reentering motorcycling after a hiatus, high prices can be an obstacle for buying a cruiser. It doesn’t have to be. 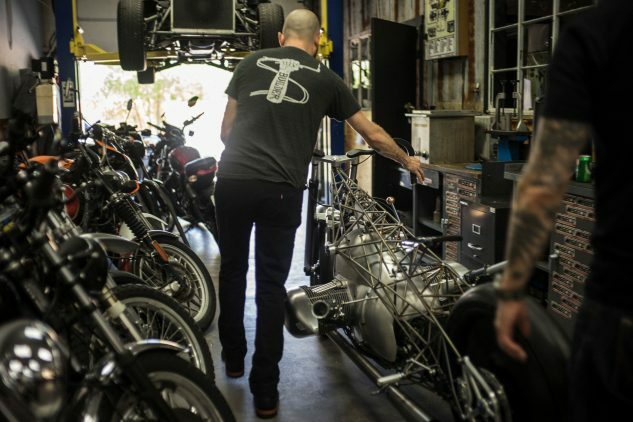 The staff at Motorcycle.com have always been fans of cruisers and what they represent out on the road. So, we decided to go deal shopping to see what new models could be had for less than $10,000. Note that all of these motorcycles are 2019 models. You can find some great deals on leftovers from earlier model years if you look around. 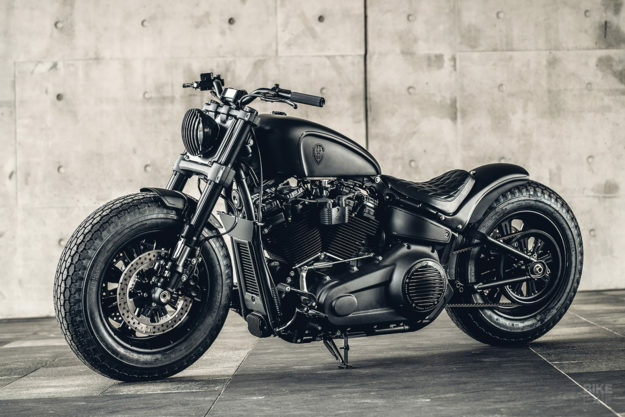 You can be excused for thinking that the Harley-Davidson Iron 1200 is just an Iron 883 with a 1,202 cc V-Twin wedged into its frame. Although the 1200 rides on the same chassis as its littler sibling, it still has some tricks up its sleeve. 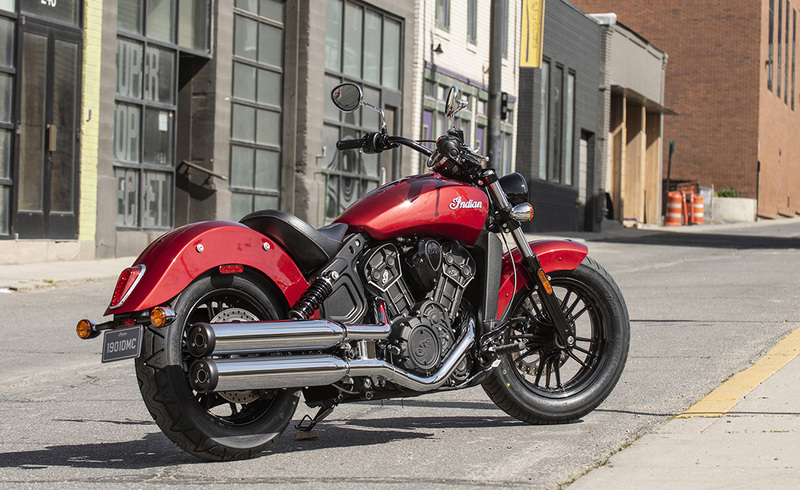 At a glance, the mini-apes stand out in comparison to the 883’s flatter handlebar. This places the rider in a more upright and relaxed riding position. The big difference, though, is the big air-cooled V-Twin. The rubber mounts allow the engine to dance at stoplights while keeping excessive vibes from reaching you at speed. The wide power delivery is great for meandering around town, and there’s plenty of grunt to blast up to highway speeds as you row your way through the 5-speed gearbox. However, those mini-apes mean that you’re not in the best position for combating the wind blast, and the bikini fairing doesn’t do much to help. So, most Iron 1200s will be found trolling the boulevard. The 28.6-inch seat height means that it is easy for almost any rider to reach the ground. 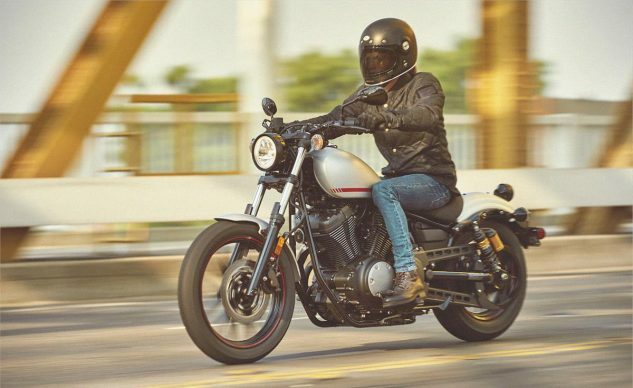 Additionally, the 1200 Sportster engine places the claimed 564 lb. weight low in the frame for easy low-speed maneuvers. 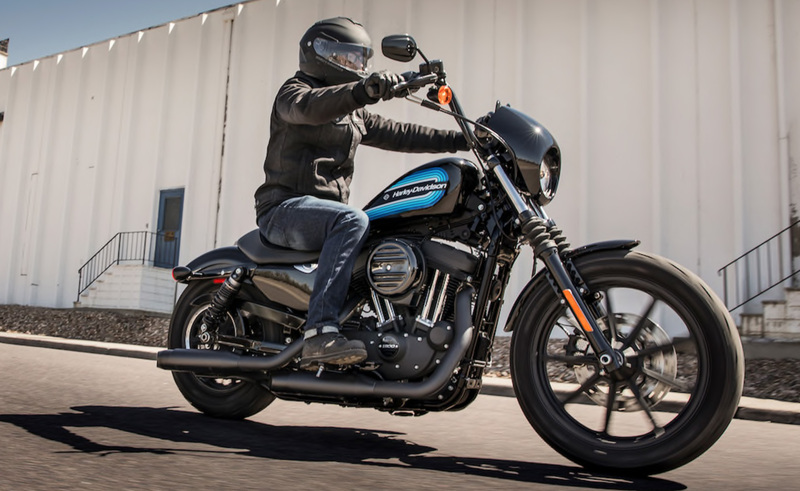 The bobbed fenders, solo seat, and 19-inch front wheel paired with the 16-inch rear give the Iron 1200 attitude to spare. You can have yours in Vivid Black for just $9,999. To some people, cruisers are all about leather and chrome. Others prefer a more understated presence. 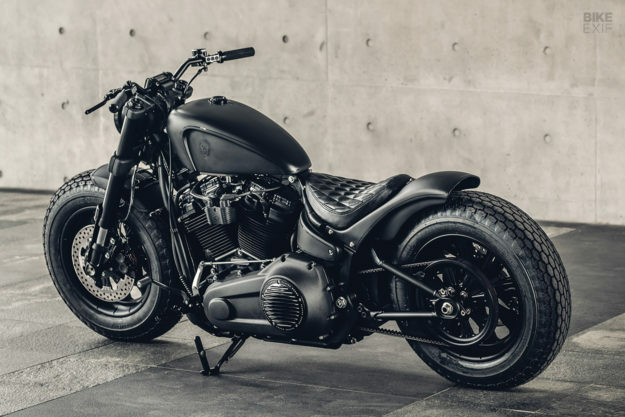 The Honda Shadow Phantom with its blacked out look – save for the exhaust system – will appeal to the latter. Weighing in at a claimed 549 lb. with a 25.8-inch seat height, the Phantom isn’t so big that it’s intimidating but not so small that experienced riders will feel it is underpowered. The 64.5-inch wheelbase assures a full-sized feel. The engine is a 745cc liquid-cooled 52-degree V-twin fed by three valves per cylinder. Honda’s PGM-FI handles mixing duties while a staggered dual exhaust system handles the spent gasses. 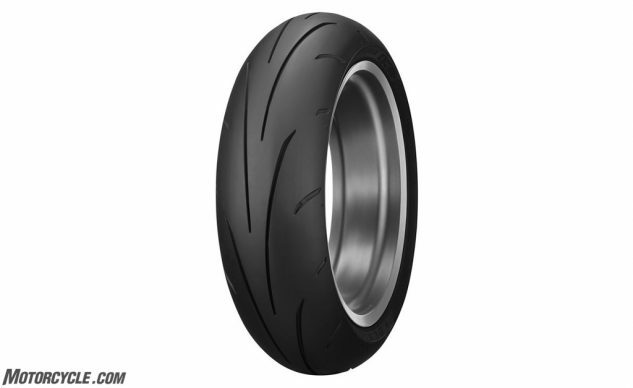 Delivering power to the fat 160/80 R15 rear tire is a low-maintenance shaft drive. 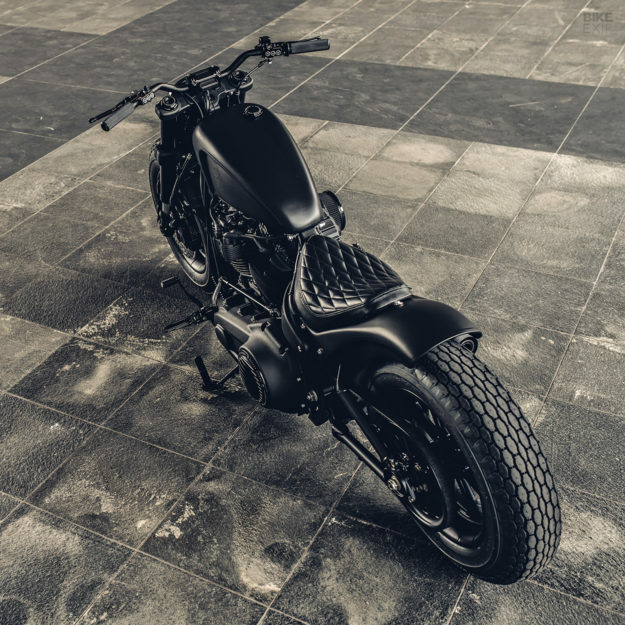 The low-slung bobber styling looks subtly cool in either gloss black or white paint options. 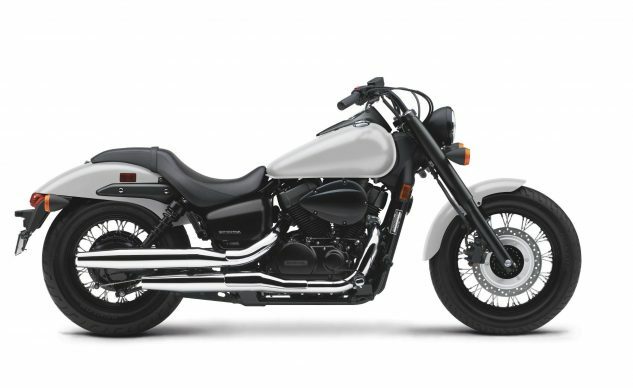 Honda’s got a 2019 Shadow Phantom waiting for you at its website. Indian made a smart move when it released the Scout Sixty. The Sixty has just about everything we loved about MO’s 2015 Motorcycle of the Year, the Indian Scout – only with 134 fewer cc’s and one less gear in the transmission. The engine displaces a healthy 999cc thanks to its 93 x 73.6 mm bore and stroke. Our visit to the dyno showed that the Sixty only lost 14 hp and 3.1 lb-ft with the decrease in displacement. Not bad for a $2000 price cut. A fair trade, if you ask us. 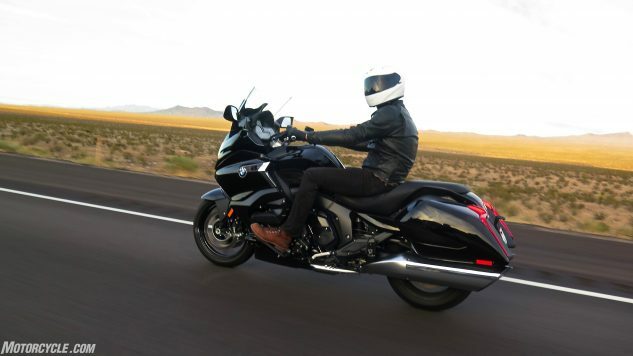 Other than the pleasant engine that’s on the sporty side of cruising, the Scout Sixty runs smoothly and has decent handling characteristics – until you run out of ground clearance. That, however, is the nature of the feet-forward riding position of cruisers. While the rear suspension could use a little more travel – or an aftermarket upgrade – the brakes work just fine. Finally, the Scout Sixty feels like a real bargain since it has the same quality fit and finish of other Indians. It may lack a few shiny bits of its big brother, but we think we prefer it that way. 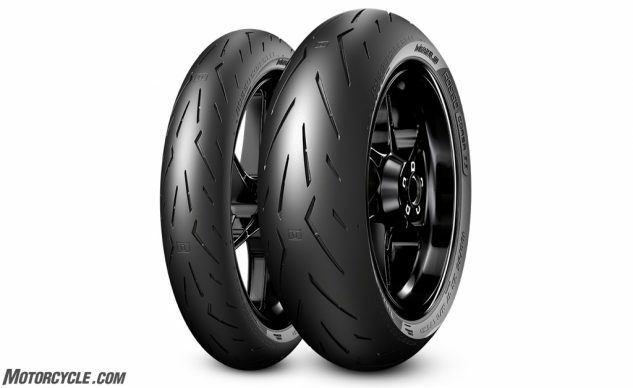 Thunder Black paint and the lack of ABS are what keeps the Sixty’s price under $10k. The Ruby Metallic Red shown in the photo retails for $10,799 and, like all the optional colors, comes with ABS. 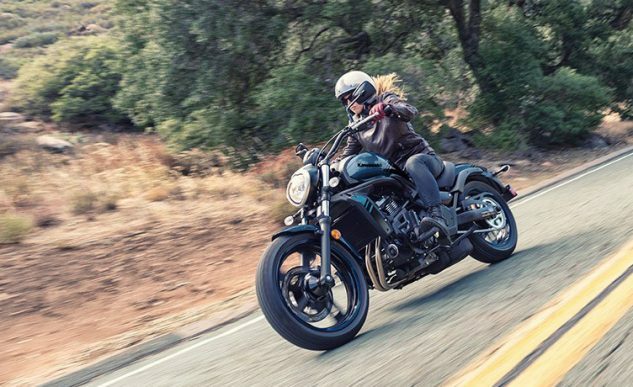 The Kawasaki Vulcan S bucks cruiser norms in a couple of ways. 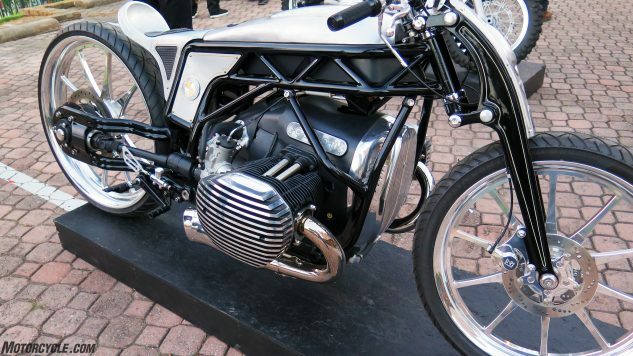 First, it eschews the de rigueur V-Twin in favor of a Parallel Twin. Say what?! Then the styling draws more from the twenty-first century than from the Post War era embraced by the majority of cruisers. Clearly, Kawasaki wanted to turn some heads. 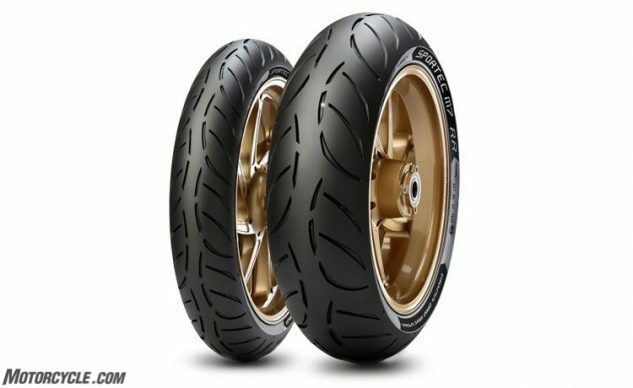 However, neither of those are the most interesting feature of the Vulcan S. The Ergo-Fit adjustable construction that allows the bike to be adapted to riders of many shapes and sizes is what really makes the Vulcan S stand out. By offering adjustable handlebar placement, peg location, and seat sizes, Kawasaki has it divided along three size ranges: Reduced Reach (<5-ft 6-in. ), Mid-Reach (between 5-ft. 7-in. and 6-ft. 0-in. – also known as the standard shipping form), and Extended Reach (> 6-ft.). The flexibility allows for up to 18 different size combinations. Riders are sure to be able to find the ideal fit for their body size. Then there’s the lovable 649cc Parallel Twin that was derived from the Ninja 650 and is also used in the Versys 650 and Z650. While it was retuned for cruiser duty, it still loves to rev out into the upper rpm range. The Vulcan S is happy to troll along around town in the lower rpm, but you’ll be surprised when you find an entrance ramp or a winding road to wick up the throttle. This post-modern cruiser has a lot to offer. When writing this article, we noticed a strange thing, Yamaha doesn’t have any cruiser category listed on its web site. Never you mind though, the Yamaha Bolt R-Spec is still a cruiser – despite its new Sport Heritage listing. 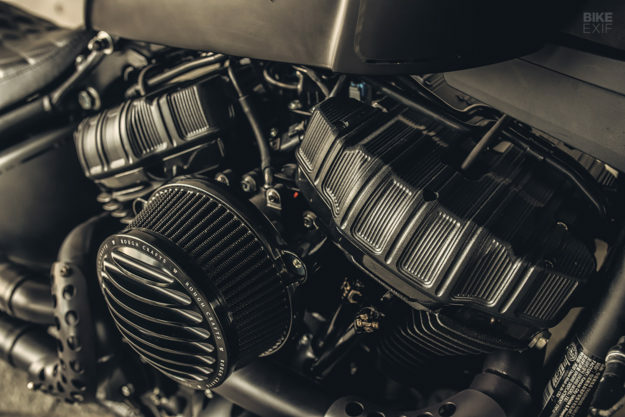 Powered by a 60° 942cc air-cooled SOHC V-twin (the same engine that powered the erstwhile V-Star 950 and the 950 Tourer), the Bolt in any of its iterations uses forged pistons with ceramic cylinder liners for better cooling and durability. The two-valves per cylinder are plenty to give this bike an amiable character both around town and on the highway. Shorter inseamed folks will appreciate the 27.2-inch reach to the ground. 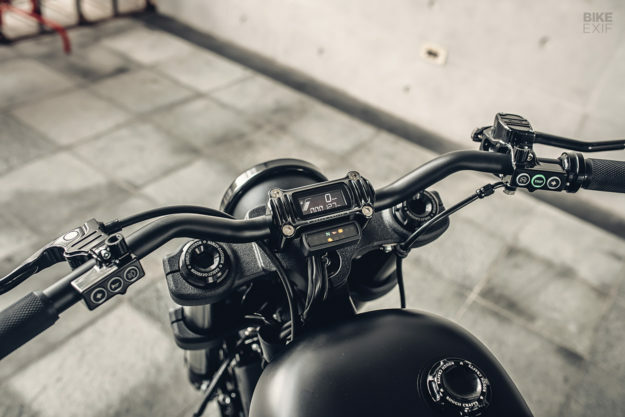 While the riding position in the lower body is less cruiser and more standard, with its slightly forward peg location, the upright torso and pulled back handlebar is reminiscent of home-built bobbers of yore. 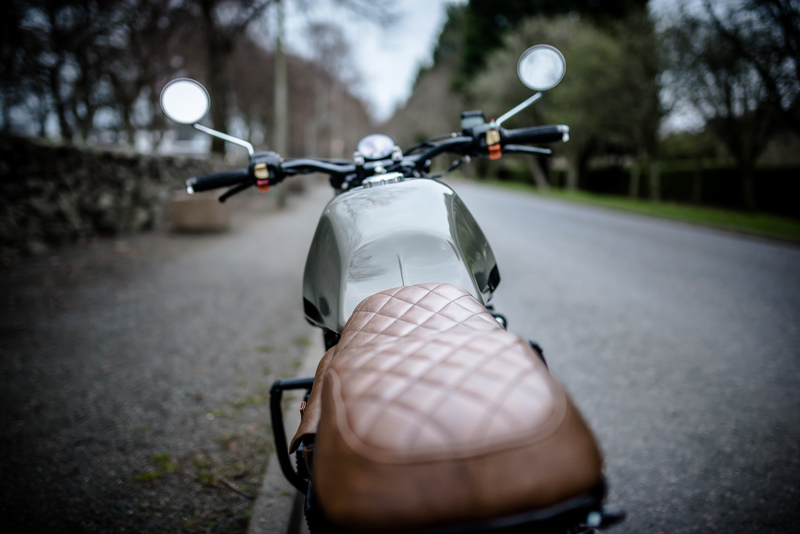 Look no further than the abbreviated fenders – and the solo seat – to add to the bobber impression. 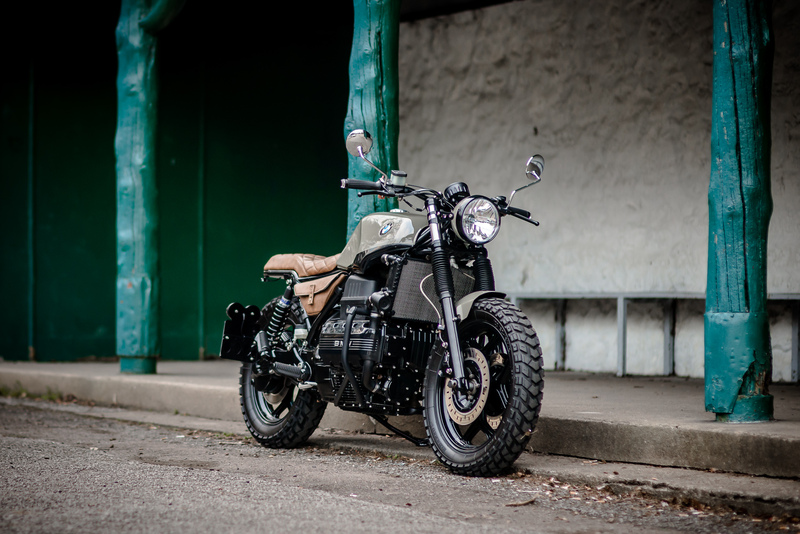 The gearing and power delivery are geared towards use in more urban environments, but that doesn’t mean that the Bolt R-Spec doesn’t have the chops to take the party to the open road. 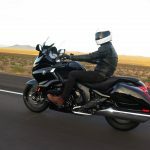 The post Best Cruisers Under $10,000 appeared first on Motorcycle.com. 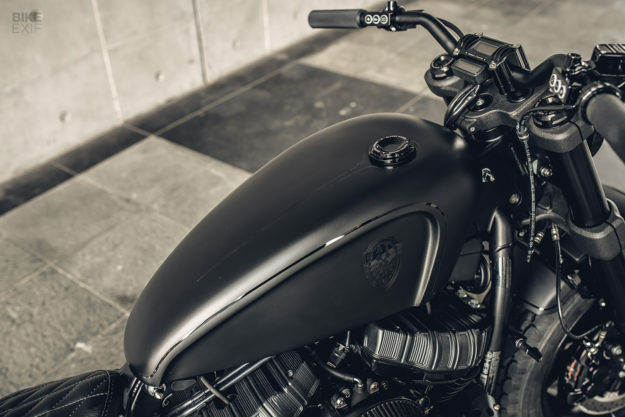 It’s been almost nine years since we featured the Rough Crafts ‘Iron Guerilla‘—a murdered-out Harley-Davidson Sportster that flung Taiwanese customizer Winston Yeh firmly into the spotlight. It was only Winston’s second build, but it immediately established his signature style. You’ll still find traces of the Iron Guerilla’s DNA in Winston’s work today. And it spawned a catalogue of Rough Crafts parts that still sell well (and are frequently copied). Now, for his latest release, Winston’s gone right back to his roots. 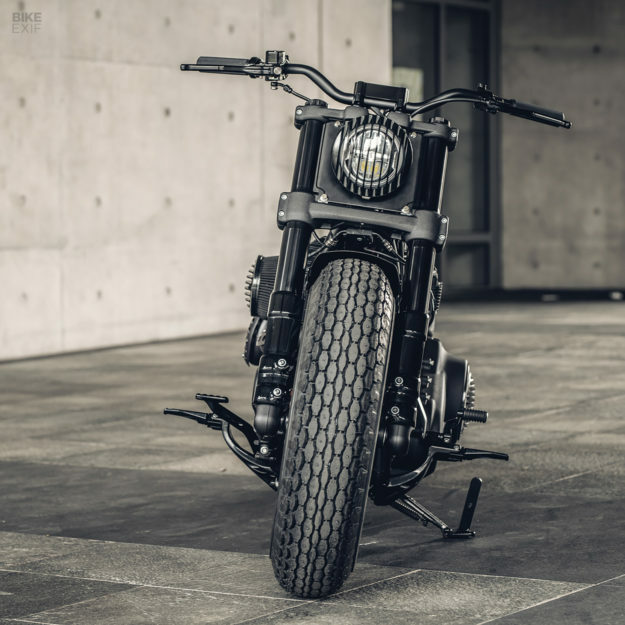 This is the ‘Mighty Guerilla’—an updated take on the classic Rough Crafts Guerilla formula, based on a 2018 Harley-Davidson Fat Bob 107. 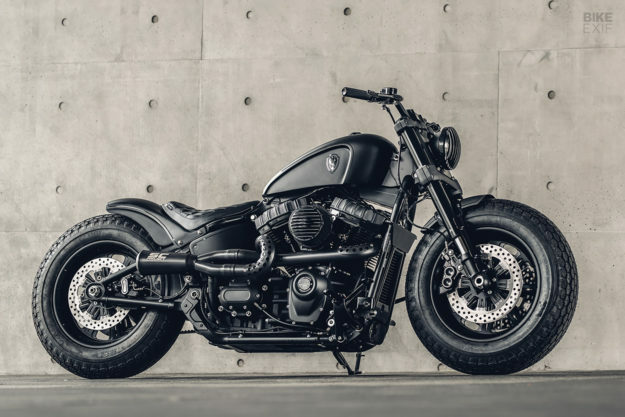 The Fat Bob has the most distinct styling of all the new H-D Softails, but Winston’s done away with most of it. It still rolls on chunky 16” wheels—but these are now matching Performance Machine Riviera items, in a finish dubbed ‘Black Ops.’ The tires are the same as the original Iron Guerilla: 5” wide Coker Beck blackwalls. Most of the chassis is still stock—but it’s been slammed. 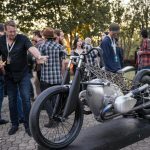 The OEM upside-down front forks have been lowered a touch, and there’s a shorter-than-stock Progressive Suspension shock hiding in the Softail’s faux-hardtail rear end. 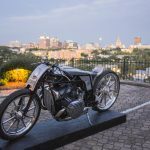 Winston also upgraded the front brakes with Arlen Ness calipers and Performance Machine rotors, and added a Performance Machine pulley at the back. The motor internals are stock too, but there’s a small power boost from the new intake and pipes. Winston used an Arlen Ness Big Sucker intake, capped off with a cover plate in the traditional Rough Crafts style. For the exhaust, SC Project sent Winston a couple of mufflers to combine with his Guerilla-style headers. 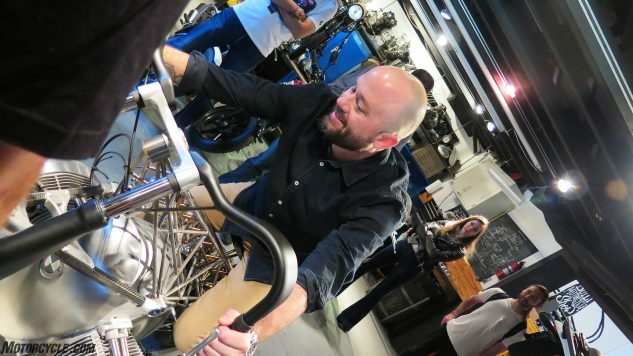 He built two systems—one for this bike, and one to send back as a prototype for future production. 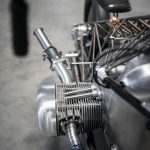 The rest of the engine mods are cosmetic, including new rocker box covers from Arlen Ness, and a set of custom push rod collars from 2 Abnormal Sides. Winston also designed new Rough Crafts clutch and timing covers, and refinished a few choice parts in black. But it’s the new bodywork that really conveys that unmistakable Rough Crafts Guerilla vibe. 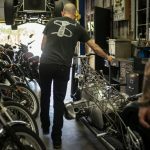 The fuel tank’s actually been lifted from a Sportster—then lengthened, narrowed vertically and scalloped. 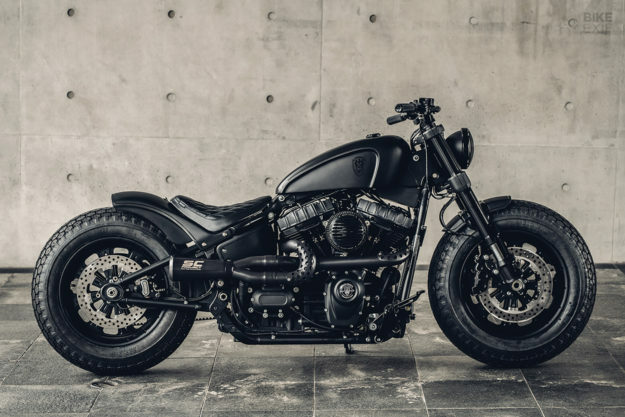 It mounts straight onto the Fat Bob’s fastening points, and is finished off with a Rough Crafts catalogue fuel cap. Up front is a short fender and a custom headlight arrangement. 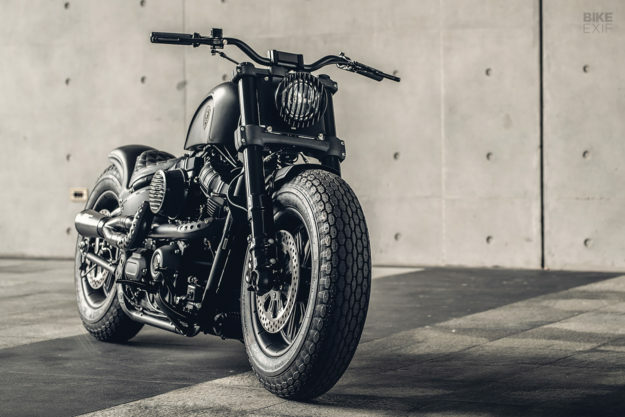 Winston already had a headlight grill for the Sportster Forty-Eight in his catalogue, so he combined a Forty-Eight headlight housing with the LED internals from a Street Bob, and slapped the grill on. It all mounts off a custom backing plate that attaches to the original Fat Bob headlight’s mountings. Out back, Winston designed a new seat, and a rear fender that mounts straight to the Fat Bob’s rear strut mounts. 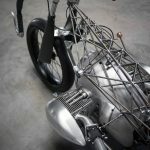 The seat pan and fender were shaped from fiber glass, using molds that were 3D printed. 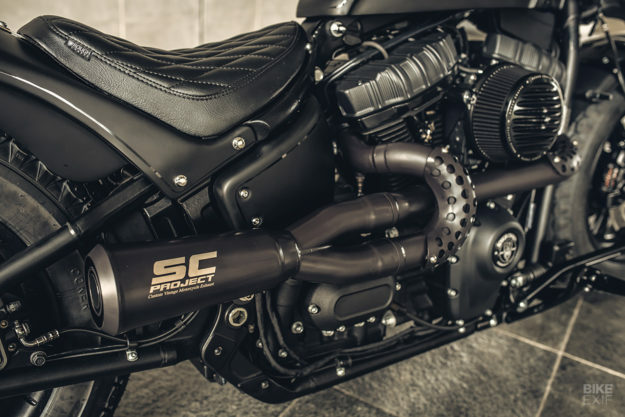 For the control area, Winston picked Rough Crafts Fighter bars, Arlen Ness grips, and Rebuffini controls, complete with switches that work with Harley’s OEM CAN bus. The stock foot controls were upgraded with MS Pro pegs, and there are Rizoma LEDs doing tail light and turn signal duty. The speedo’s a really neat setup. 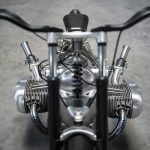 Winston used the tiny, riser-mounted speedo from a Street Bob—but designed a new housing that mimics his signature Rough Crafts ribbed risers. Everything’s wrapped in a classic Rough Crafts paint scheme: flat black, with subtle gloss black pin-striping. 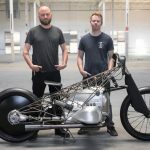 The paint was handled by the same guy that painted the original Iron Guerilla—and every other Rough Crafts bike since—Jeffrey Chang at Air Runner Custom Paint. 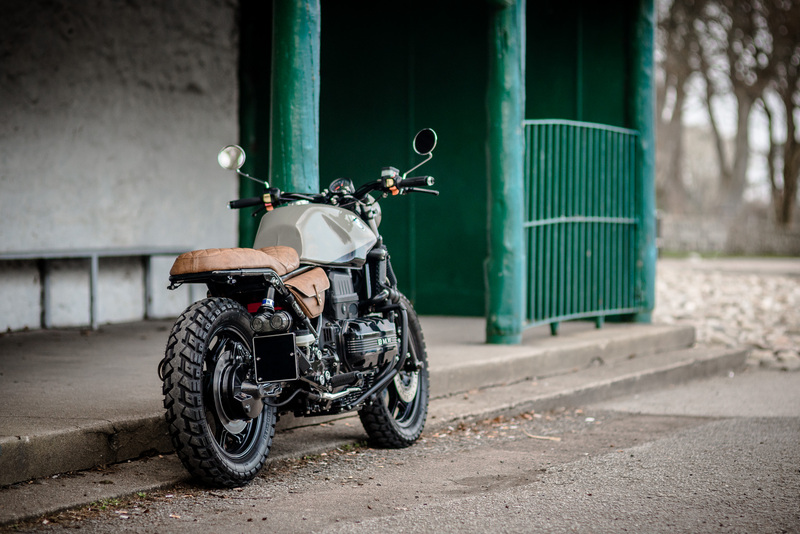 Hechun seats tackled the diamond stitched saddle, and CT-Garage took care of final assembly. All of this begs the question: will these new Softail-specific Rough Crafts parts be available soon? Winston assures us it’s in the works…which means we can look forward to another decade of the mighty Rough Crafts Guerilla. 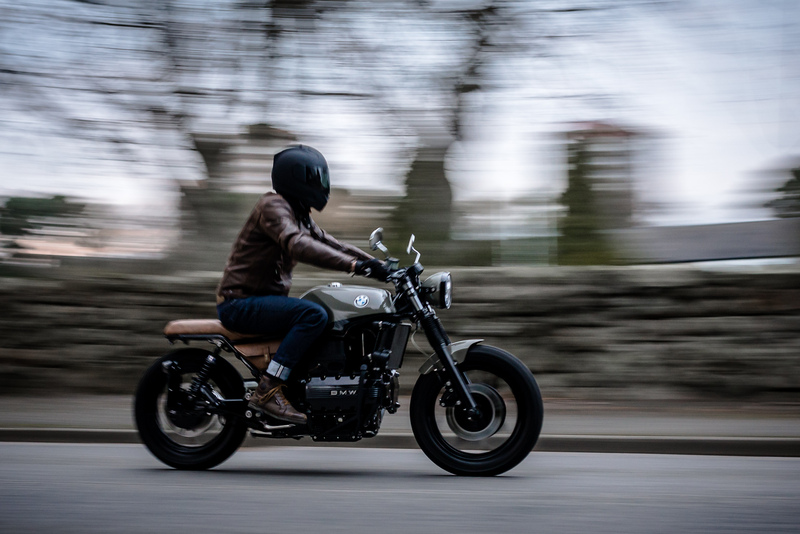 As the world’s largest producer of motorcycles, it comes as no surprise that Honda cafe racer builds are commonplace here on Return of the Cafe Racers. If you’ve got your heart set on using a Honda as the donor when you’re building a cafe racer project you’re spoilt for options. 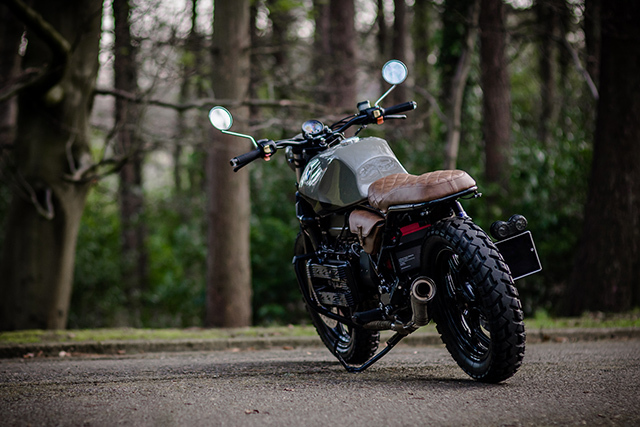 There’s a long list of “go to” models that are have become icons of the cafe racer scene like the CB750, or pretty much any model in the long-running CB range, the CX500 and in more recent years the CB1000R Neo Sports Cafe. So today I thought we’d take a look back at 10 of the best Honda Cafe Racer builds that have graced these pages. Oh, did I mention it was totally fire damaged? David is a man right after our own heart’s and despite being new to the game he committed to a full on rebuild, right down to having that thumping four banger split to the cases! “The difficulty was making the bike appear older than its original mid ’80s touring form and getting around the arguably strange and sharp tank lines the K100 bears once fully naked but I could picture it well in my mind,” David explains. Down to a bare chassis David commenced work on the tubular space frame and with it all smoothed out, it looks brand new in a fresh coat of black. 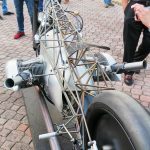 Now he could begin to assemble it as a roller and the shaft driven swingarm is now controlled by a Hagon monoshock. Up front and the forks look better than the day they rolled out of the factory, now complete with gaiters. While the repainted factory wheels are now wrapped up in a set of all purpose Heidenau K60 Tires. The big horizontal four cylinder engine is definitely not what you’d normally see a new rider bolting into their first bike. But perfectly pieced back together the smooth torque monster will provide years of trouble free motoring; as any well built BMW should! A new lightweight battery kicks things to life but it’s the soundtrack that is drastically improved with a C4R 4 into 1 exhaust system that has the added benefit of providing some extra punch. 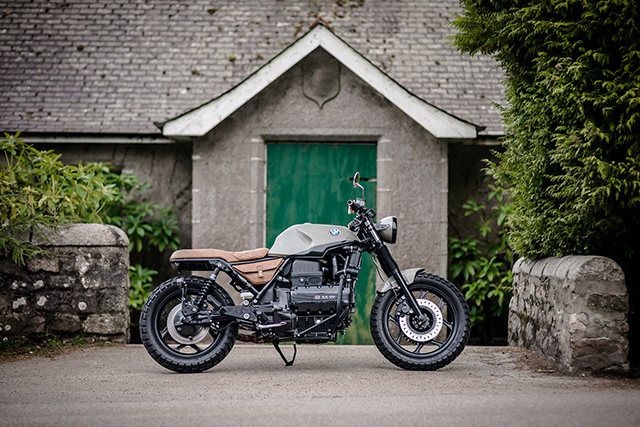 To get the look of the bike David was after he focused on steering the styling away from the ’80s to something far more timeless. 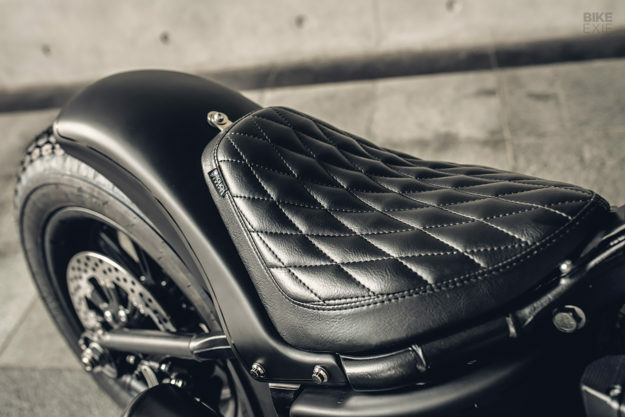 To achieve this he began with a custom seat, wrapped in a neutral leather that has been finished in a classic diamond stitch. 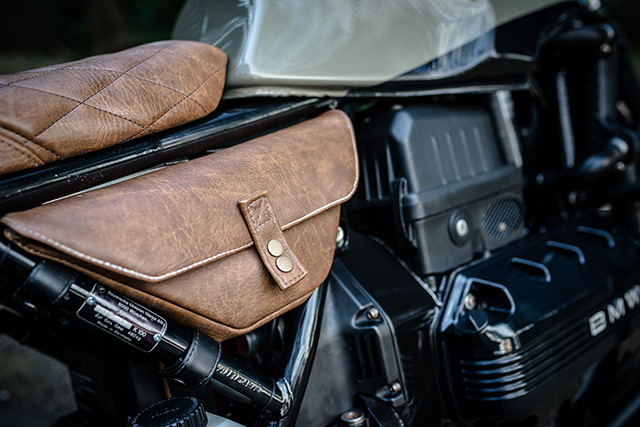 To complement the look, the side covers are replaced by very function friendly leather saddle bags. With the metal work now resplendent in the two-tone gloss metallic paint that helps to dissolve the sharp lines of the tank. 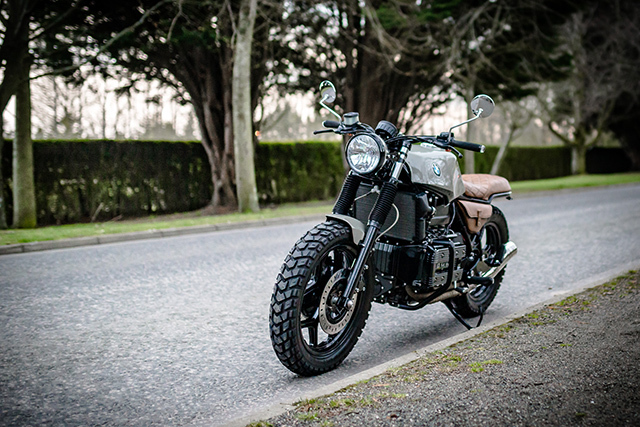 To ensure ‘Revive’ was a pleasant place to spend time, the ergonomics get a full make over with LSL bars sporting Motogadget indicators that are also used at the rear. A new Shinyo headlight and Acewell speedo keep the front end clean and uncluttered with a custom side mounted taillight assembly doing the same for the rear. “I wanted it to be functional and comfortable as it would also become my daily ride,” David smiles. And it’s mission accomplished, with a killer custom any first timer would be lucky to ride and rightfully proud to say they built it on their own! 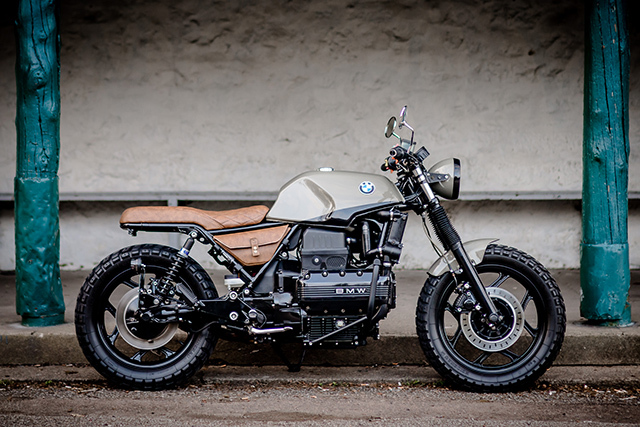 When I learned I was off to Austin last week with just a couple days notice, on a mysterious mission to see something BMW wanted to unleash on the public, somebody showed me a picture of the Custom Works Zon bike from Japan, “Departed.” When I looked at it I LOL’d oh ho ho!, and said no way is BMW building anything remotely like that. And especially no way on the Japanese custom’s oversize boxer Twin, complete with pushrod tubes. You gots to be kidding me. 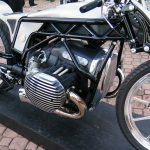 Surely that engine is some kind of mock-up representing an electric motor with two small saddlebags? 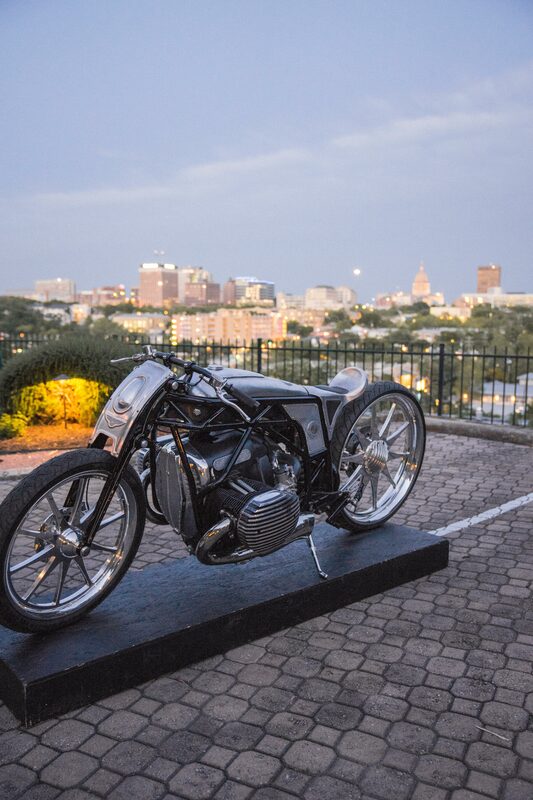 In fact, the Departed is BMW enough that BMW brought it to Austin to show off at the Handbuilt Show. 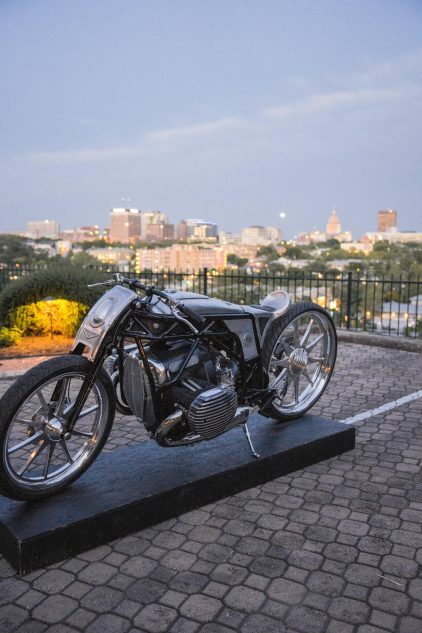 When we got to the big unveil in Austin on the Thursday night before the US MotoGP, though, what did the giddy German BMW execs roll out but another custom barely containing that same giant boxer Twin, this one built by Revival Cycles in Austin. In the “Birdcage,” that flat Twin looks even bigger than it does in the Custom Works Zon bike, which already can’t help but make you think of a thin woman with huge, ahh, cylinders, even if you are suffering from low T.
Another angle of the Departed really gives the Big Boxer some scale; the rear wheel is a 26 incher. 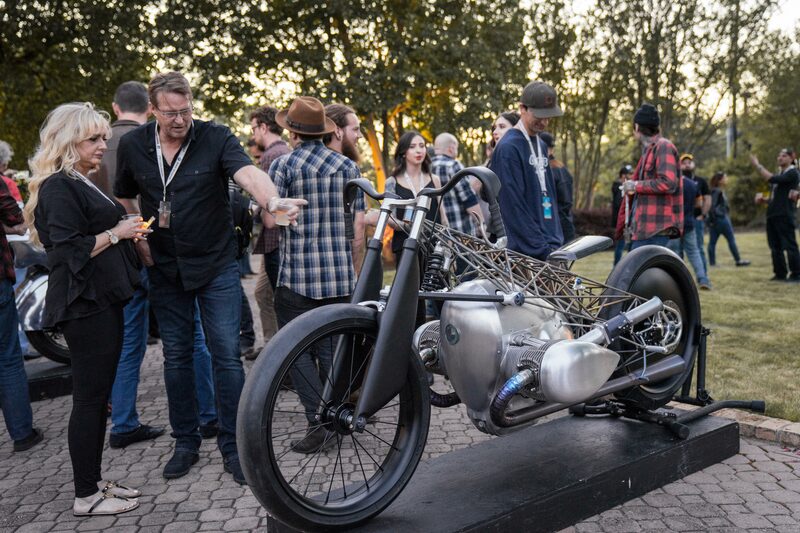 In Austin, we were allowed to see the engine, but BMW didn’t want to tell us anything about it other than it displaces about 1800cc, is air- and oil-cooled, and yes the pushrod tubes contain pushrods. If I’d been paying attention (or if MO’s news section had been displaying properly), I wouldn’t have been surprised; Dennis had already spotted the R18 two weeks earlier and determined its legitimacy. Timo Resch, BMW Motorrad’s VP of Sales and Marketing, says we’ll see more of a “direction in a couple of weeks,” which another exec let slide means the Villa d’ Este Bike Show, on the shores of Lake Como, schedjed this year for May 24-26 (and conveniently enough, sponsored by BMW). 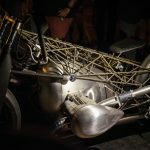 Even crazier, Timo says there will be a “serial bike” by 2020, which I believe is German for a production model. Say, that’s only nine months from now. 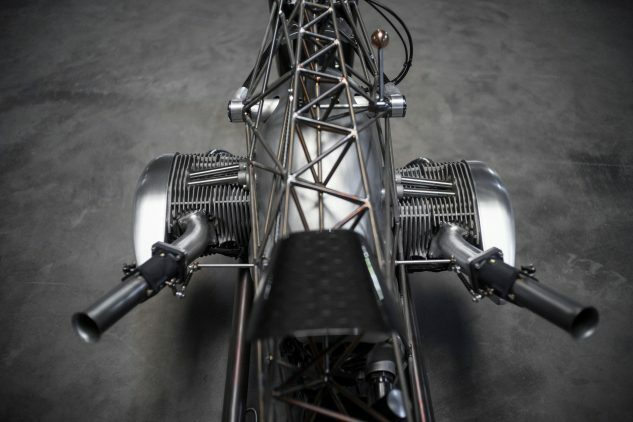 Revival’s design brief from BMW was to build a bike that really shows off the engine. 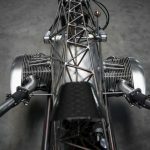 I’d say the nearly transparent titanium Birdcage does that successfully, even if its machined covers also disguise it. Wheels are 23 inches at both ends. People kept offering it cocktails but it doesn’t drink. 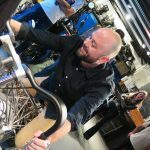 Alan Stulberg of Revival Cycles in Austin is the guy BMW picked to showcase the Big Boxer, so why not weld up a birdcage frame out of titanium? His first birdcage, his first experience with a titanium frame – and also he says this is the first time he’s sat on the bike. Behind him stands Luciana de Oliveira Francisco, BMW’s National Marketing and Brand Manager straight outta São Paulo, Brazil. Strange but not unprecedented. 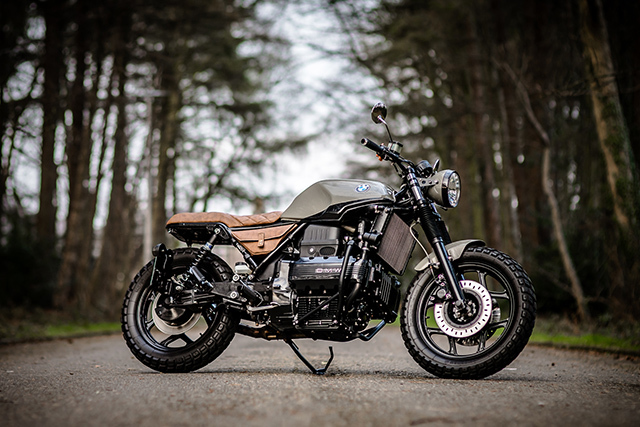 Before BMW launched the K1600B a couple years ago, there was a vinyl wood-panel adorned Roland Sands custom that appeared at the Long Beach show after it had been unveiled earlier that year at Villa d’Este. That bike appeared to be a stretch even for Roland, but it entered production not long after. 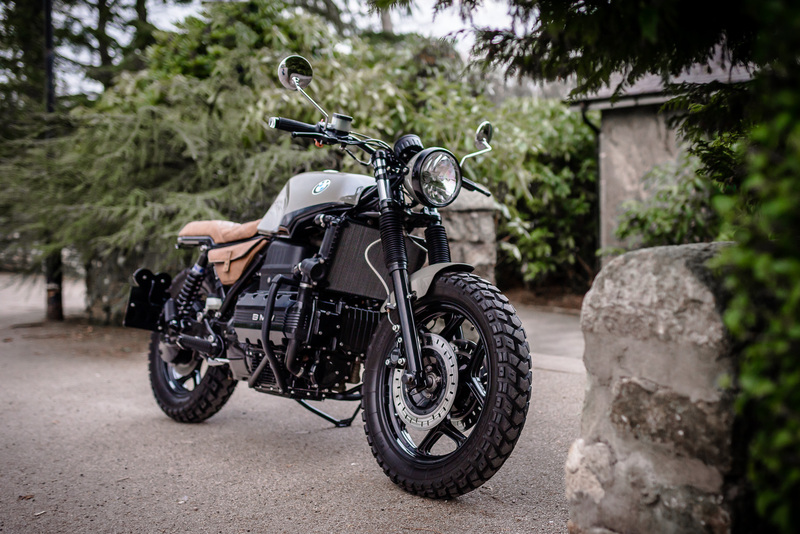 With its inline Six, the K1600B was something of a compromise but we’re told it sells reasonably well; as a result of its success, BMW has been champing at the bit to get back into the real cruiser market; they’ve apparently been at work on the Big Boxer for quite some time. Now the company line is that the failed R1200C of 1997 was ahead of its time, a fact proven by its ascendant collectibility. If you say so. I personally love the K1600B’s bike’s Jekyll and Hyde personality – by day a cruiser and by night a two-wheeled Formula 1 car (or is it the other way round?). But even in MO’s own Big Dam Tour comparison last year, which the BMW won, more than a couple of the kids thought a bike with an 8000-rpm 160-horsepower six-cylinder just can’t be considered a legit cruiser. Well it’s certainly no Harley, said Joopy Jaswinski. To counter that, maybe BMW decided it needs a thing that doesn’t just go like hell, but one that also throbs like only a thing with a pair of 900 cc cylinders can do. If that’s what the barbarians want, we’ll give it to them. 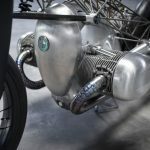 An 1800cc boxer ought to do the trick, and if you’re concerned any bike with this engine will have compromised cornering clearance (eyeballing it, I bet it’s four inches wider than the latest 1250 boxer), maybe you’re speaking the cruiser language again – though it’s hard to picture BMW ever going down the scraping-cylinders road. 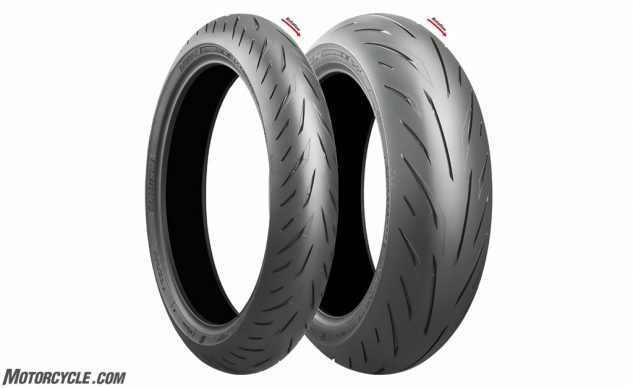 Maybe they can source some really long footpeg feelers from Honda’s suppliers. 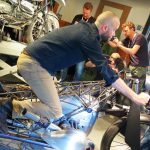 In the spy photos at Motorrad, it appears the engine’s just mounted that much higher in the frame. Pushrods make perfect sense in this behemoth, since using a cam-in-block design makes each cylinder head protrude slightly less. And since a thing this big usually isn’t going to exceed 6000 rpm, overhead cams just aren’t necessary. 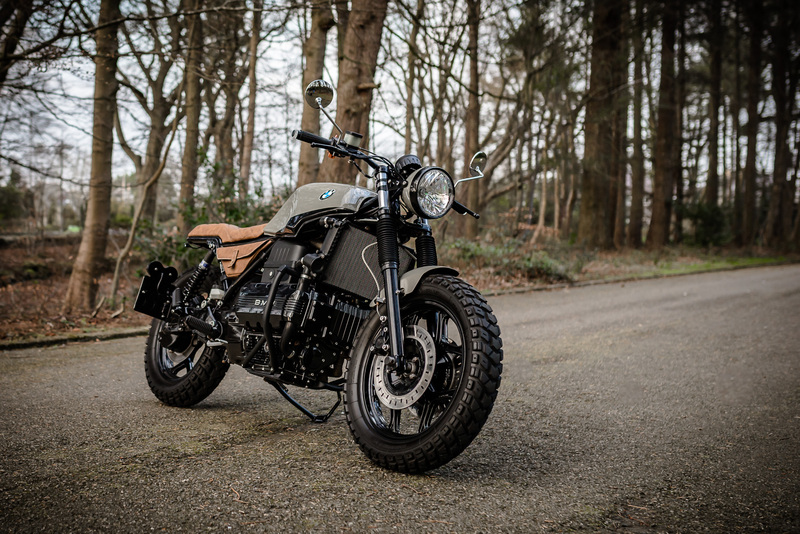 BMW’s latest R1250 Boxer displaces 1254cc via an oversquare bore and stroke of 102.5 x 76mm, and makes a claimed 105 lb-ft of torque at the crank, but not until 6250 rpm. That just won’t do for a big American style cruiser. 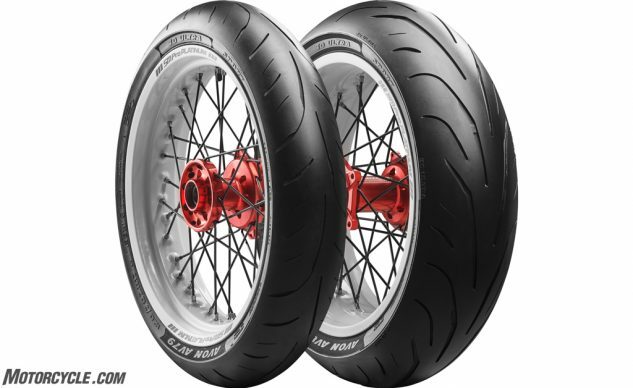 Yamaha’s Eluder had the biggest Twin in last year’s Big Dam Tour comparo, 1854cc, and it gets there with a bore and stroke of 100 x 118mm. The next-biggest Indian “Thunderstroke” 111 cubic-incher (1811cc) measures 101 x 113mm. On the Dynojet, both of those bikes made 105 lb-ft of torque at just 2800 rpm (105.8 for the Yamaha). The Yamaha’s all done by 4500 rpm, and the Indian signs off not many rpm later. Harley’s 114 cubic incher (1868cc; 102mm x 114.3mm) made 104 lb-ft and 82 horses on the dyno in a 2018 Fat Bob, also at less than 3000 rpm. There’s really no telling how BMW will play it, but the Germans do seem out to prove a point lately. 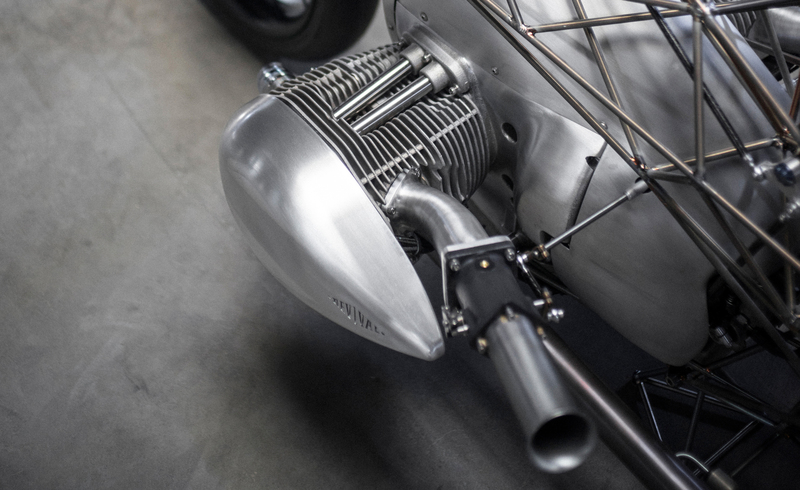 At 4500 rpm, the longest-stroking giant v-Twin out there Yamaha Eluder has a piston speed of 3484 feet per minute – not all that high. Even with a pair of 4-inch pistons, there’s room for more rpm and more power. Personally, I’d rather see something like one-quarter of an oversquare 454 Chevrolet V-8 – 113.5 cubic inches – with bore and stroke of 108 x 101.6 resulting in a pushrod-rattling boxer easily capable of 6000 rpm, monstrous low-rev torque and well over 100 horsepower. Why not? They tell me the Big Boxer is an all-new engine that shares no parts with any previous Boxer. If we’ve reached peak boxer, why not do it right? Can we get some titanium connecting rods? 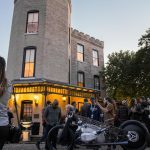 Stulberg says the engine in his Birdcage is really loud, but he wouldn’t start it up for us, and has anybody heard Departed run? I think not. 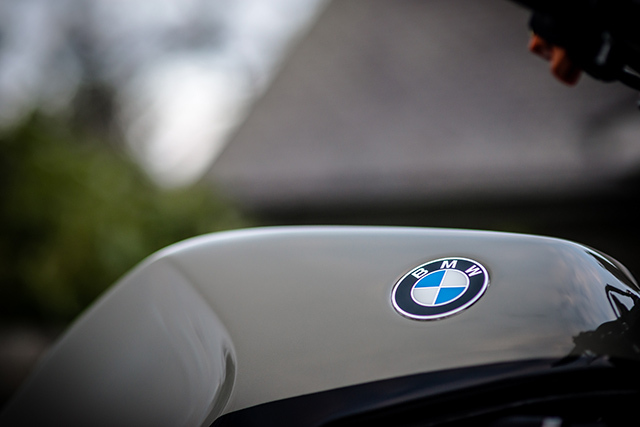 Maybe BMW is still thinking about how bad it wants to embarrass all the other manufacturers? 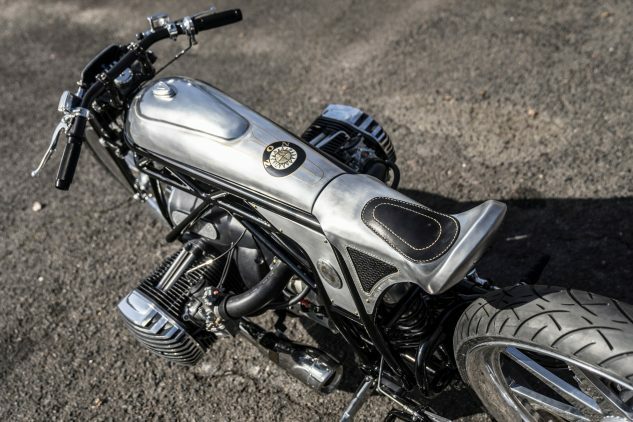 As for us, we’re down with an 1800cc Big Boxer cruiser. 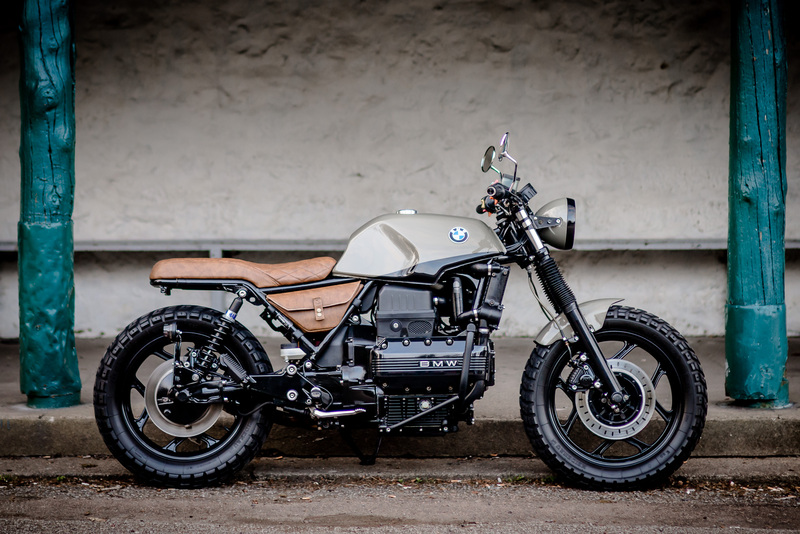 Just please don’t put it in a GS Adventure and expect me to ride it in the sand. Our times are exciting enough already. 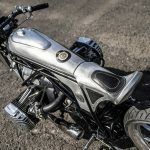 The post BMW’s Big Boxer is On the Way appeared first on Motorcycle.com.